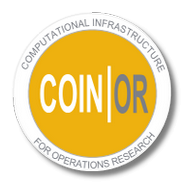 This page presents outside resources related to COIN-OR. Information on COIN-OR projects themselves may be found through the Projects page or the Documentation page. Suggestions for links to include on this page may be emailed to editor at coin-or.org. GNU Scientific Library: C library for mathematical functions, including random variables, statistics, linear algebra, and lots more. Maxima: computer algebra, similar to Mathematica or Maple. Octave: matrix based mathematics, similar to and “mostly compatible” with MATLAB. QtsPlus4Calc: a collection of OpenOffice spreadsheets that solve a variety of problems related to queueing theory. R: statistics, graphics, and more. Similar to S-plus (both are based on the language S). Shogun: a large-scale machine learning toolbox.